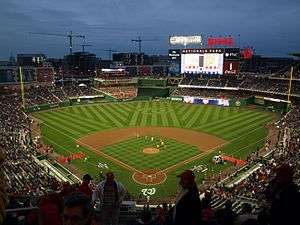 The park's name echoes the original name of the early-1900s ballpark used by the Washington Senators/Nationals, which was called National Park until it was rebuilt and renamed Griffith Stadium. The name was originally a temporary name, as the Lerner Family had planned to sell its naming rights. When a strong bid never surfaced, the team chose to stick with Nationals Park. The stadium and its grounds are owned by Events DC. Nationals Park will host the 2018 Major League Baseball All-Star Game, the first All-Star Game to be played in Washington, D.C. since 1969. Nationals Park is also home to the traditional Presidents Race during the fourth inning. Several Metrobus routes and the DC Circulator's Union Station-Navy Yard Route serve the park. Various other transit options include a water taxi service from Alexandria, Virginia and Georgetown. After it was announced that the Expos would leave Montreal, Washington, DC began looking for a site for a baseball stadium to lure the team to Washington. 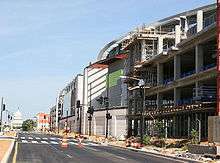 After considering sites near RFK Stadium, in NoMA and straddling I-395 at Banneker Park the District announced on September 21, 2004 that they had chosen a site near the SE Anacostia waterfront. The 2008 Washington Nationals season was the team's first in Nationals Park. 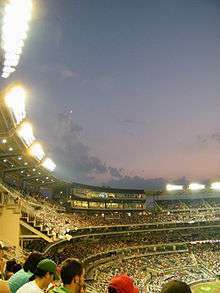 The George Washington University (GW) and the Nationals announced in February 2008 that the GW Colonials baseball team would play the first game in Nationals Park on March 22, 2008. GW played Saint Joseph's University in an afternoon game and the hometown Colonials had a 9–4 victory over Saint Joseph's. The Nationals opened the 2008 MLB season in Nationals Park with a rare one-game series against the Atlanta Braves on March 30, which served as the first official MLB game at the park. True to tradition, President George W. Bush threw out the ceremonial first pitch. The Nationals defeated the Braves 3–2 with a walk-off home run from Ryan Zimmerman, giving the Nationals their first opening day win since moving to Washington. Chipper Jones of the Braves hit the first batted ball and first home run, while the Nationals' Cristian Guzman got the first base hit. According to the Elias Sports Bureau, Zimmerman's game-winning home run was the third walk-off home run in major-league history to be hit in the first MLB game played at a stadium. The game was the most-watched MLB opening night in the history of ESPN. Before the Nationals 2009 home opener on April 13, 2009 at 3 PM, longtime Philadelphia Phillies announcer Harry Kalas was found unconscious in the Nationals Park press box at 12:20 PM. Kalas was rushed to George Washington University Hospital and pronounced dead at 1:20 PM. A moment of silence was held before the game, followed by both Nationals and Phillies fans applauding Kalas in tribute. The Phillies played with a picture of Kalas in their dugout. On January 1, 2015, Nationals Park hosted the 2015 NHL Winter Classic before a crowd of 42,832 spectators. The Washington Capitals defeated the Chicago Blackhawks 3-2 after former Capital, Troy Brouer, scored the go-ahead goal with less than 13 seconds remaining in regulation play. This made the Capitals only the second home team to win a Winter Classic, and the first to win two Winter Classics, having won in Pittsburgh in 2011. As of the 2016 season, the ballpark has 41,313 seats and features 79 suites on three levels, all around the infield. Team President Stan Kasten also said that the team might sell the naming rights to the levels of the luxury suites, which currently bear the names of presidents Washington, Jefferson and Lincoln. While the city agreed to spend up to $611 million, Kasten has stated that the principal owners, the Lerner family, spent tens of millions of dollars more on "jazzing up the park". The park has an out-of-town scoreboard, which is 102 feet (31 m) long, installed in the right field wall. The main scoreboard, at 101 feet (31 m) long and 47 feet (14 m) high, is more than five times the size of the one at RFK Stadium. On March 13, 2007, Kasten announced that there would be a grove of cherry blossoms located just beyond the left field bleachers. Kasten stated that the cherry blossoms will provide a look that Americans associate with the nation's capital. Another feature, The Red Porch, is a full service sit-down restaurant located in center field. It offers some amenities unusual in a ballpark such as salads, along with regular ballpark fare such as burgers and hot dogs. When the stadium first opened in 2008, the restaurant was enclosed by glass windows with a view of the field which were soon made retractable. The restaurant was eventually expanded to outside the interior, with tables being placed in three rows outside. Seating in Nationals Park is divided into over a dozen different pricing zones. There are four seating levels: the field level, mezzanine level, gallery level, and upper gallery level. The Grandstand is composed of sections 401 and 402, in the corner of the upper deck in left field, in which seats are $5 for all games. Tickets go on sale 2½ hours before the first pitch on the day of the game and cannot be ordered in advance. The stadium features three levels of upscale luxury seating. The largest of the three, the Norfolk Southern Club, is a two-story indoor lounge exclusively for fans with tickets in sections 206-221. The lounge is 33,000 square feet (3,100 m2) and features various food entities, live television broadcasts of the game on dozens of TVs, and views of the Anacostia River. It was previously named the Stars and Stripes Club until the naming rights were purchased by Norfolk Southern Railway in 2014. The PNC Diamond Club, the naming rights of which were purchased by PNC Bank, is on the field level between the two dugouts. It was remodeled and expanded into two floors prior to the 2016 season. The Delta Sky360 Club seats are located right behind home plate and are the most expensive seats in the stadium and include access to an indoor lounge. It was previously named the Lexus Presidents Club until Delta Airlines purchased the naming rights in 2016. As features were changed, added, or removed, seating capacity has changed repeatedly since the stadium opened; the number of seats has dropped slightly several times since it opened in 2008. In the inaugural 2008 season, seating capacity was 41,888; as of 2016, the seating capacity is 41,313. Nationals Park has hosted a number of non-baseball events, such as concerts and business meetings. Performers who have held concerts at Nationals Park include Billy Joel, Taylor Swift, and Paul McCartney, among others. On April 17, 2008, Pope Benedict XVI celebrated Mass at Nationals Park for 47,000 people during his visit to the United States. There were 200,000 requests submitted for tickets to the Mass. 1 2 "Washington Nationals on the Forbes MLB Team Valuations List". Forbes. March 23, 2016. Retrieved April 11, 2016. ↑ "New Nationals Park: Quick Facts". Washington Nationals. Retrieved January 22, 2009. 1 2 "George Washington University Baseball Team to Play First Game at Nationals Park" (Press release). Major League Baseball Advanced Media. February 29, 2008. Retrieved March 20, 2008. ↑ Ladson, Bill (December 18, 2007). "All Eyes on Nationals to Open Season". MLB Advanced Media. Retrieved December 18, 2007. 1 2 "Ballpark's Final Tag: $693 million". Washington Times. January 7, 2009. Retrieved July 27, 2013. ↑ "Nationals Park – MLB Washington Nationals". Brailsford & Dunlavey. Retrieved August 25, 2013. ↑ Lambert, Lisa (March 28, 2008). "Washington DC Home to First "Green" Stadium in U.S.". Reuters. Thomson Reuters. Retrieved September 27, 2013. ↑ Seidel, Jeff (March 14, 2006). "New Ballpark Design Unveiled: Nationals Aiming to Begin Play in New Stadium in 2008". Major League Baseball Advanced Media. Retrieved March 14, 2006. ↑ "Paying for the Ballpark". Washington Post. March 24, 2008. Retrieved July 27, 2013. ↑ "Nationals Park Facts & Figures". Major League Baseball Advanced Media. Retrieved April 10, 2010. ↑ "Washington Nationals". Forbes. March 1, 2012. Archived from the original on September 1, 2012. Retrieved April 3, 2012. ↑ "Nationals Park". Washington Convention and Sports Authority. Retrieved April 4, 2013. ↑ Ladson, Bill (April 6, 2015). "Nationals awarded 2018 All-Star Game". MLB.com. Retrieved April 7, 2015. ↑ Kovaleski, Serge F.; Heath, Thomas (22 September 2004). "DC Offers Waterfront Baseball Stadium". Retrieved 3 June 2016. ↑ "Major League Stadium". Build It Bigger. Season 1. Episode 14. October 17, 2007. Discovery Channel. ↑ Phillips, Michael (March 22, 2008). "GW, St. Joseph's Honored to Open Field". Major League Baseball Advanced Media. Retrieved March 22, 2008. ↑ Phillips, Michael (March 29, 2008). "Nationals Victorious in Stadium Debut". Major League Baseball Advanced Media. Retrieved March 29, 2008. ↑ Associated Press (March 30, 2008). "Nats' Zimmerman Plays Hero With Game-Winning Shot in Opener". ESPN. Retrieved March 30, 2008. ↑ More on Zim. The Washington Times. April 2, 2008. ↑ Svrluga, Barry (April 2, 2008). "Nationals Park Debut Sets ESPN Record". The Washington Post. Retrieved April 2, 2008. ↑ Mathis, Sommer (April 9, 2004). "Click Click: New Artwork at Nationals Park". DCist.com. Retrieved April 9, 2009. ↑ Salisbury, Jim (April 13, 2009). "Phils Announcer Harry Kalas Dies". The Philadelphia Inquirer. Retrieved May 22, 2009. ↑ Seidel, Jeff (April 12, 2009). "Phils Pull Out Emotional Win Over Nats". Major League Baseball Advanced Media. Retrieved May 22, 2009. ↑ Haft, Chris (June 4, 2009). "Big Unit Gets 300th Win on First Try". Major League Baseball Advanced Media. Retrieved June 4, 2009. ↑ Ladson, Bill (July 4, 2009). "Dunn Belts 300th Career Homer". Major League Baseball Advanced Media. Retrieved July 4, 2009. ↑ Verducci, Tom (May 18, 2010). "Nationals Taking Safe Road With Strasburg But Is It Right One?". Sports Illustrated. Retrieved June 4, 2010. ↑ Klein, Allison (March 19, 2011). "DC Reviving Hall of Fame for Stars of Its Sports World". The Washington Post. Retrieved March 19, 2011. ↑ "Nationals Unveil New Culinary Offerings from Union Square Hospitality Group at Miller Lite Scoreboard Walk on Tuesday, June 14" (Press release). Major League Baseball Advanced Media. June 13, 2011. Retrieved June 13, 2011. ↑ Steinberg, Dan (February 3, 2012). "Nationals Launch 'Take Back the Park' Campaign". The Washington Post. Retrieved August 24, 2012. ↑ Calcaterra, Craig (May 4, 2012). "The Nats Beat the Phillies … With Natitude". NBC Sports. Retrieved May 5, 2012. ↑ DeBonis, Mike; Wagner, James (November 27, 2013). "Nationals sought a retractable roof with taxpayer money. District mayor Vincent Gray said no.". Washington Post. Retrieved November 27, 2013. ↑ LeDuc, Daniel (March 4, 2008). "Giving You the Score, Plus a Whole Lot More". The Washington Post. Retrieved May 20, 2010. ↑ Muret, Don (November 26, 2007). 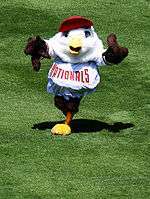 "PNC Bank Buys Naming Rights for Nationals Seats". Washington Business Journal. Retrieved November 27, 2007. ↑ LeDuc, Daniel; Duggan, Paul (March 28, 2008). "Built at the Speed of a Fastball, Stadium Is Ready for Nationals". The Washington Post. Retrieved April 11, 2016. ↑ Elsibai, Nadine (April 17, 2008). "Pope Benedict Says Mass Before 47,000 in New Washington Stadium". Bloomberg L.P. Retrieved April 17, 2008. 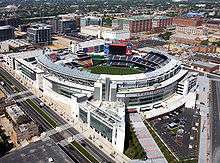 Wikimedia Commons has media related to Nationals Park.